Rainbow Rowell will charm readers with her debut romantic comedy novel — now available in paperback – and a must-read to add to your To Be Read (TBR) list for Spring. What would you do if your job was to read other people’s personal emails? That’s what Lincoln finds himself doing after he is hired as an Internet security officer at a newspaper office. One of his job responsibilities is monitoring emails for anything inappropriate, and making sure the employees are not abusing the system and sending personal emails. He stumbles upon the conversations between writer Jennifer Scribner-Snyder and her best friend, movie critic Beth Fremont. The girls share everything with each other — stories about boys, work, co-workers — and Lincoln has privy to all their information. Instead of sending a warning email to Beth and Jen to cool it with the personal exchanges, Lincoln keeps reading… and eventually realizes he is falling in love with Beth. Problem? Beth has a boyfriend. Problem? Lincoln has no idea what Beth looks like, so tracking her down to reveal his feelings could be an issue. Problem? Tracking her down and revealing his feelings could come off quite creepy instead of romantic, seeing as how they’ve never met, yet he knows her private thoughts and feelings. 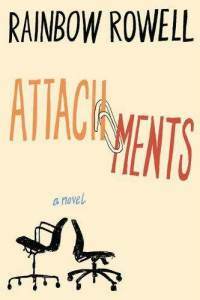 Attachments is the light-hearted romantic comedy from Rainbow Rowell that dives into the 21st-century qualms of dating. Even though Lincoln could come off a bit stalker-ish in his ways of getting to know Beth, the story had a very sweet innocence about it. The writing of the story in unique — Jen and Beth are both major characters but have very few physical scenes throughout the way. Their dialogue is almost all through the email messages they send back and forth. Readers follow Lincoln through his scenes and how his story comes about. Many romances and chick-lit books focus on the female characters, but Rainbow Rowell pushes the stereotype and makes her a charming debut one to check out.